One of the fun aspects of bird feeding is that you never know who might show up in your yard. 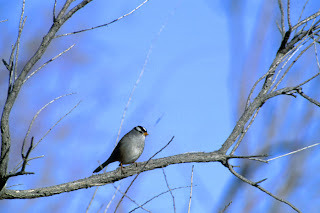 Every November in mid-Michigan I wait anxiously for the arrival of the White-crowned Sparrows. At 7 inches, these are some of the largest sparrows that come to our feeding areas. 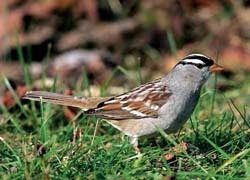 Their size and the bold black and white racing stripes on their head make the White-crowned Sparrows a happy addition to the usual suspects in the yard. Mainly ground feeders, they scritch and scratch the dirt looking for leftover sunflower seeds and millet. They also eat weed seeds, berries, buds and moss. Mid-Michigan isn’t a nesting territory for these birds. We only see them from late April to late May and sometime in September to November. White-crowned Sparrows have about 10 different calls. During migration you will usually hear their high thin seet or sharp pink call. They breed all along the upper parts of Canada and winter along the southern United States. People sometimes confuse them with their close relative the White-throated Sparrow but they do not have the white throat markings.